You are currently browsing the tag archive for the ‘no light and heat for prisoners’ tag. 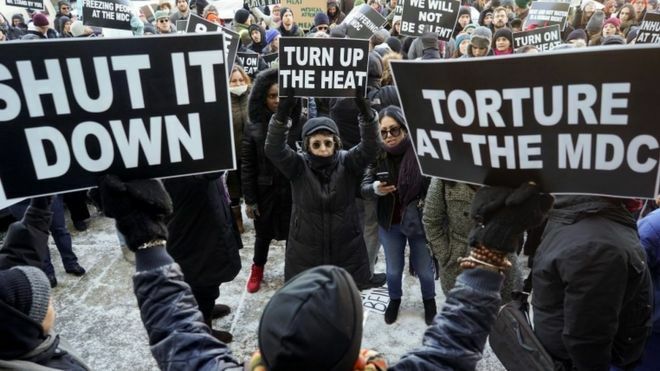 Friends and relatives of inmates stuck in cells without power or heat at a prison in New York have held a protest against their detention conditions. Protesters outside the Metropolitan Detention Center, a federal facility in Brooklyn, chanted: “Where is the heat”? Many inmates have not been able to contact the outside world for days, following a partial power failure. Members of Congress who visited the prison on Saturday described the situation there as a “nightmare”. How bad are the conditions? “It is like living in a closet without lights,” said Representative Nydia Velázquez, a Democrat whose district includes the prison. She said temperatures in some cells were as low as 49 F (9.5C). Jerrold Nadler, another US House member for New York, condemned the authorities’ “total lack of urgency and concern”. He told the crowd outside the prison – which houses more than 1,600 inmates – that power was unlikely to be restored until Monday. The protesters carried signs reading “Shut it down”, “Torture at the MDC”, “United in outrage” and “Turn up the heat”. One tweeted that the prisoners were banging windows as the demonstrators were gathering outside. I am outside of the Metropolitan Detention Center where prisoners are without heat. The banging noise is them protesting for all of us to hear. They are without heat for days. This is in BROOKLYN. Officials say the failure was the result of a fire that destroyed an electrical panel. The fire melted a switch designed to turn on a back-up generator. The bureau also said that the building had emergency lighting. 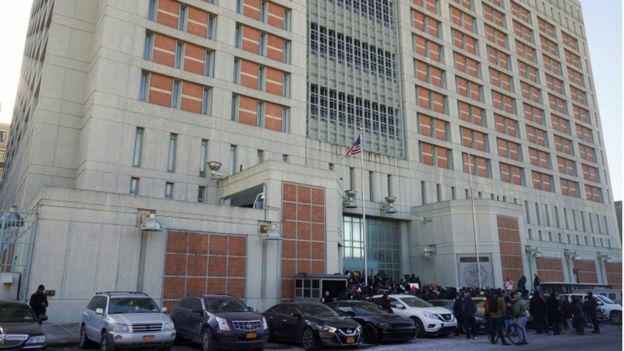 In a tweet late on Saturday, New York City Mayor Bill de Blasio condemned the federal authorities and said the city was providing blankets for the prisoners.
.@nycemergencymgt just delivered generators, blankets and hand warmers to the Metropolitan Detention Center. The people inside have a right to dignity and safety and we won’t stand by while the Federal Bureau of Prisons fails them. NYC stands ready to do all we can to help.